Meropi takes me on a tour of the building. Entire families live crammed in single rooms. “At least they have found a place to stay. Most of the migrants only have the streets”. 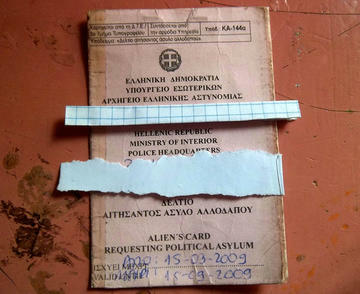 Forty-five thousand asylum seekers are estimated to be in Greece, while there are practically no shelters. We hear a car horn down the street. We look out the balcony. A Greek boy is unloading tomato cases, detergents, packs of pasta, powdered milk from the trunk. “People give us a lot of support, otherwise we would not be able to make it. But I do not know how long it will last. The social situation in Greece is a time bomb and, unfortunately, the economic crisis is speeding times up even more”.